Although water is essential to life, it can cause terrible troubles for home, commercial and business buildings when it comes to a residential water damage. Water damage is not a plain problem because it often results in several health and safety issues. No matter the damage is imperceptible and negligible such as a tiny water spot on the surface, or catastrophic and devastating such as flooding, it is among the major contributors to loss of property. It also leads to health problems, such as mold allergy, asthma, bronchitis, etc. Water damage can result in costly consequences. Water damage can also lead to the appearance and growth of mold, which not only ruins the walls and furniture but causes serious health problems such as asthma, bronchitis, allergy and many more. Once occurred, it’s very important to fix the problem as soon as possible. Only quality and faster remediation of your house will minimize the risk of healthy issues and property damages. Ruined household furniture and appliances or damaged electronics and plumbing equipment are only a small part of the other possible negative effects of flooding water or imperceptible moisture. Category 1 refers to Sanitary or Clear water. It is a type of water that poses no threat to human health. It is drinkable and it is safe even to inhale it. This type of water damage is most often caused by broken household appliances and sink overflows. When the Sanitary water leaves its source, it can easily be contaminated and then it falls in Category 2 or 3. Category 2 refers to water contaminated by microorganisms. It is also known as Gray water. When ingested, this type of water may cause health issues because it comes from damaged toilets or sump pumps. Category 3 refers to unsanitary water, contaminated by bacteria and other microorganisms, heavy metals and other toxic substances. This type of water is also called Black water and it may cause sickness. Category 3 water damage is usually caused by contaminated standing water or broken pipes. There are four classes of water damage. They are determined by the rate of evaporation and refer to the assessment of damage repair options. Class 1 includes the most minor form of a water damage, which is the easiest to be repaired and remedied. This Class has the slowest rate of evaporation and therefore, the materials absorb a minimal amount of moisture. Class 2 refers to a flood which covers up to two feet or 24 inches up walls. The fast rate of evaporation may damage and cushions. When a water damage falls in Class 2, it is more difficult to be repaired. Class 3 refers to a water damage which affects the entire area. It is characterized by the fastest rate of evaporation. When a water damage falls in Class 3, it is usually caused by overhead sources and soaks the walls as well as the furniture. Class 4 refers to a water damage that affects materials with a low porosity, such as concrete, hardwood floors, etc. This type of damage is also called Specialty Drying Situations and requires special procedures of repair and restoration. Once a home or business is affected by a water damage, the immediate water removal is critical for the repair and restoration of furniture, carpets, floors and other damaged goods and surfaces. Therefore, only an experienced certified water damage restoration team can hadle the situation proprely to minimize the damages. Professionals understand that the speed is of paramount importance when it comes to water removal and damage repair. Homeowners themselves, building maintenance personnel, and property management professionals can also try to remove the water and repair the damaged goods. However, only reliable certified water damage repair professionals are capable to use the right procedures, the last tendencies in processes and high-tech equipment to save people’s belongings. The immediate contact with a specialist may reduce restoration costs and increase the possibility to repair the damaged items. Water Damage Repair is a team of solid experts in water damage repair and restoration. We have proven track record of successfully delivered projects. This makes us proud of saving hundreds of properties, which also shows our contribution in minimizing the risk of healthy issues for our customers. Our choice of water removal methods and repair procedures depends on the category and class of the water damage. All of our professional water damage teams use high-tech water sensing equipment, which enables them to make an accurate inspection and assess the safety risks. Detection of hidden moisture is critical for successful water damage restoration. We provide timely water removal from the damaged items and surfaces, proper ventilation and dehumidification of the affected area. Only high-tech professional equipment makes it possible to detect each centimeter where the moisture is hidden, and thus to prevent secondary water damages. 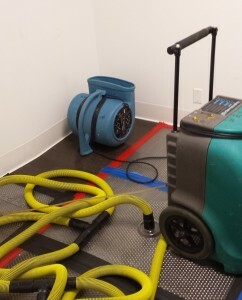 When the water removal and damage restoration is done our certified teams monitor the damaged area for any moisture left to guarantee that dehumidification is carried out properly. No matter the problem seems horrible or negligible, our professional water damage repair service is able to assess its importance and properly determine the hazards and thus to provide timely measures to remedy the situation. Even when the water damage is minimal, it is a big mistake to consider water removal and damage repair procedures as a DIY job. Generally, homeowners are not capable to estimate neither the extent of the damage nor the procedures needed to ensure that the moisture problems won’t happen again. Therefore, in case of water damage, it is of paramount importance to contact our certified water damage repair teams of professionals who will handle the situation as quickly and effectively as possible.